Overview is our film selection for this years Earth Day. The Overview Effect, first described by author Frank White in 1987, is an experience that transforms astronauts' perspective of the planet and mankind's place upon it. Common features of the experience are a feeling of awe for the planet, a profound understanding of the interconnection of all life, and a renewed sense of responsibility for taking care of the environment. OVERVIEW is a short film that explores this perspective through interviews with astronauts who have experienced the overview effect. 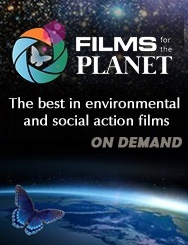 The film also features insights from commentators and thinkers on the wider implications and importance of this understanding for humanity as a whole, and especially its relevance to how we meet the tremendous challenges facing our planet at this time. "When we look down at the Earth from space we see this amazing, indescribably beautiful planet - it looks like a living, breathing organism. But it also, at the same time, looks extremely fragile." Planetary Collective, a group of visual artists, filmmakers, visual media creatives, released the short film to commemorate the fortieth anniversary of "The Blue Marble," photograph taken from space, and to document astronauts' life-changing stories of seeing the Earth from space. Embracing a multidisciplinary, multi-media approach, they bring scientists, ecologists, philosophers, and researchers together with designers, coders, and creatives to bring new perspectives to audiences around the world in fresh and innovative ways. The film is a prelude to a feature-length documentary called Continuum, and it introduces many of that project's themes: the interdependence of everyone on earth, the necessity of adopting a planetary perspective, and the meeting of spiritual experiences with the sciences.